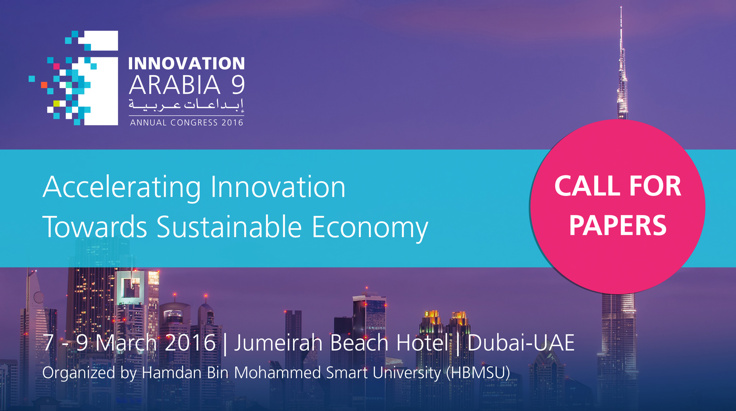 Invitation: Innovation Arabia 9 Congress Call for Papers (Dubai). Innovation Arabia 9, under the patronage of His Highness Sheikh Hamdan Bin Mohammed Bin Rashid Al Maktoum, Crown Prince of Dubai and President of HBMSU, showcases leading academic research and the latest practical solutions in four key sectors of development: management, education, health and banking and finance. The event explores solutions for the 21st century, helping to unleash economic and development opportunity waiting within the region. Under the theme of “Accelerating Innovation towards Sustainable Economy”, the Congress reflects the belief that innovation is the path towards growth, progress and a better tomorrow for the Arab World. • Quality and Business Management Conference. • Health and Environment Conference. Track 2: Business & Management. Track 3: Public Management & Government Service Excellence. Track 4: Islamic Economics, Finance, and Banking. Track 1: Big Data: A New Era in Learning Analytics. Track 2: Achieving the Potentials of Open Education. Track 3: Social Media: Changing Learning Landscapes. For online Paper Submision, kindly PRESS HERE.